Some younger readers may find this hard to believe, but there was a time when movie sequels were somewhat unusual. They certainly existed, but we also had movies which where highly successful where the producers would congratulate themselves and then move on to another project. Today, sequels seem like a given. When a movie does well at the box office, we wait for the inevitable announcement that there is going to be another one in the near future. This seems especially true with animated films which are aimed at families. Despite the work that goes into these movies (and perhaps because of it), the studios like to roll out entries in a series on a consistent basis if they can. Is there any way that the material can remain fresh with this approach? That's a question we ask as we take a look at Kung Fu Panda 3. Kung Fu Panda 3 opens some time after the events of Kung Fu Panda 2. 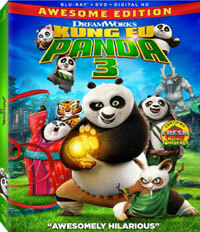 Po (voiced by Jack Black), the panda bear, continues to settle into his role at The Dragon Warrior. He is seen as a hero by the citizens of the valley, and he still likes to hang out at his father's (voiced by James Hong) noodle stand. But, Po also spends time training with the Five Masters -- Tigress (voiced by Angelina Jolie), Crane (voiced by David Cross), Viper (voiced by Lucy Liu), Monkey (voiced by Jackie Chan), and Mantis (voiced by Seth Rogen) -- and their leader, Master Shifu (voiced by Dustin Hoffman). Shifu decides that it's time for Po to become a master and take over the training of his colleagues. But, Po doesn't see himself as a teacher. Meanwhile, Kai (voiced by J.K. Simmons), an ox who was banished to the spirit realm 500 years ago, has now escaped. Using his ability to capture the chi of individuals, Kai plans to get revenge on those who imprisoned him. At this same time, Po is reunited with someone from his past, a meeting which helps to shape his destiny. In the event that you aren't familiar with the Kung Fu Panda series, the films offer an interesting combination genres. The movies are set in (an alternate version of) China and feature real kung fu fighting styles and architecture which mimics that found in China. The action sequences are pretty intense for a family film and offer a plethora of kung fu fighting. But, at the center of this is Po, an unwieldy panda bear who was not designed for fighting, much less to be a great master. And while the other voice actors at least attempt to bring a level of seriousness to their performances, especially Jolie, you've got Jack Black voicing Po, who sounds exactly like Jack Black. His language does not sound like anything from ancient China and his dialogue is peppered with modern terms. This odd juxtaposition makes the movies work. And we get more of this with Kung Fu Panda 3. The movie certainly isn't out to break the mold created by the first two films. It does wisely avoid the somewhat dark nature of Kung Fu Panda 2 and it allows Po to stretch as a character by placing him in a mentoring role. The movie's other big development is that it brings in other pandas, allowing Po to explore who he is. The themes don't get too deep here, but looking at the three films, we can see how the message has gone from believing in yourself and following your dreams to learning how to find your place in a community and pass along your knowledge to others, no matter how unique the style of that teaching may be. The problem with Kung Fu Panda 3 is that it feels like exactly what it is -- more of the same. Is that a bad thing? Possibly not, but I was hoping for something a little more fresh here. Instead, we get the same jokes about Po being inept and Shifu being inpatient. Kai is very reminiscent of Tai Lung from the first film, although the inclusion of his jade henchmen makes him somewhat unique. The introduction of more pandas opens the door for more characters, but this eventually becomes a one-note joke. Yes, there are still some laugh-out-loud moments, and Black continues to shine as Po (and you'll often wonder how much of his dialogue is scripted). The animation here is very impressive, as Directors Alessandro Carloni and Jennifer Yuh has inserted many artistic touches, including Chinese characters and many appearances of the Yin-Yang symbol. However, Kung Fu Panda 3 still remains mediocre. It's entertaining and I'm sure that kids will love it, but you can't help but feel that more could be done with Po. Kung Fu Panda 3 dispenses with the chitty-chat-chat on Blu-ray Disc courtesy of 20th Century Fox Home Entertainment. The film has been letterboxed at 2.35:1 and the Disc contains an AVC 1080p HD transfer which runs at an average of 30 Mbps. The image is incredibly sharp and clear, showing no defects from the source materials. The colors look great, most notably brighter tones, and the image is never overly dark or bright. The picture is insanely crisp, which lends it a great amount of detail. Even in this 2D version, the depth of the image is quite evident. The Disc carries a DTS-HD Master Audio 7.1 track which runs at 48 kHz and an average of 5.4 Mbps. The track provides clear dialogue and sound effects. The action sequences deliver very detailed stereo and surround effects, and we can pick out individual sounds. These effects show good separation, as sound moves from front to back and side to side. The subwoofer effects are impressive as well, adding palpable "thumps" to the fight scenes. The Kung Fu Panda 3 Blu-ray Disc contains an assortment of extras. "Everybody Loves a Panda Party" (3 minutes) is just a music-video for a song which is a variation of "Kung Fu Fighting". The song can also be viewed in a karaoke version. "Po's Poster of Awesomeness" (4 minutes) offers a closer look at the decorations at the noodle shop. "Panda Paws" (2 minutes) is an odd short which shows Mei-Mei auditioning for a show. "Make a Panda Party Paper Pal" (4 minutes) show you how to make a paper Po. "Play Like a Panda" (5 minutes) has the directors talking about how they observed real baby pandas while researching the film. "The Origin of 'Skadoosh'" (2 minutes) has Po explaining how he created his catchphrase. "Faux Paws" (8 minutes) is a reel of three DELETED SCENES, two of which are fully animated, complete with introductions by the directors. "Gallery of Epic Artfulness" is a series of stills from the film. The final extra is the THEATRICAL TRAILER for the movie.